With only a few weeks until Arrow returns to The CW we finally have a trailer for the new season. Better late than never right? Well, despite its late release this trailer gave us a great look at what’s to comes this season. From returning problems, new problems, a familiar/unfamiliar face and the rise of the Green Arrow, this Season – or more likely the first half of this Season – looks to be one of the biggest and revolutionary Seasons of Arrow yet. So let’s take a Closer Look! When we last saw Oliver Queen, he was tired of the vigilante life. He’d seen how it made him loose those close to him and could bring unwanted threats to his doorstep. With all these revelations and The Arrow thought dead – thanks to Roy Harper – Oliver and Felicity drive off into the sunset. So when we pick up with Oliver here, we see him and Felicity enjoying their new home life. That is, until a new threat emerges – the ‘Ghosts’ lead by Damien Darhk. 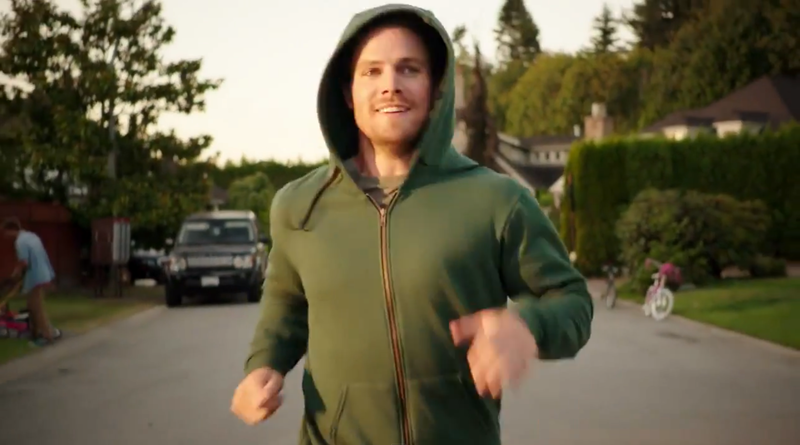 I’m willing to bet there’s another reason for Oliver’s return to crime fighting, but I’ll get to that a little later. Really Oliver? Do you not own any clothes beside Green Hoods? One way or another, Oliver returns to the front lines as the newly created Green Arrow. This is a new hero and will reflect how Oliver has changed himself in the past few months. He’s lighter. He’s enjoyed life now rather than being stranded and fighting for his life. This could lead to us getting a more quippy Green Arrow like we know from the comics. But despite this being a new Arrow, some old problems are sure to return. Before Oliver drove off into the sunset, he had broke a lot of people’s trusts – especially Diggle’s. Threatening your best friends wife usually leads to some hard feelings. So when Oliver does return, don’t expect him and Diggle to be as close as they used to be. We can even hear signs of this in the trailer about how they don’t have each other’s backs and how Diggle still feels Oliver abandoned them. Though it won’t just be Diggle as even Lance’s distrust of Oliver remains – something that might be remedied with another character’s return. The other big leave-offs last Season all revolved around The League. 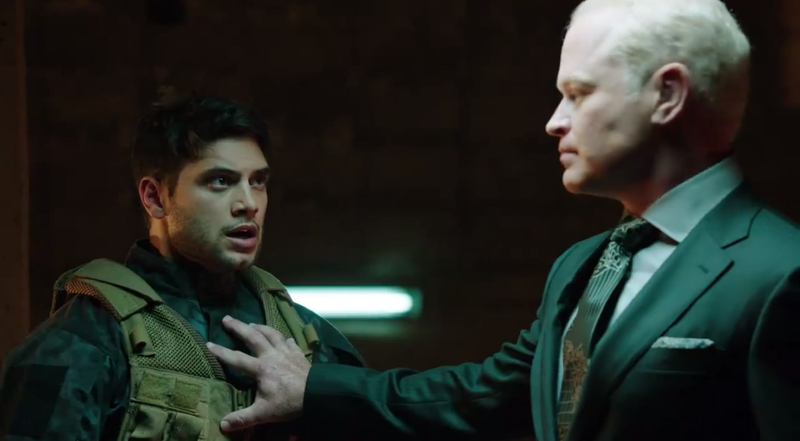 This of course means mention of Damien Darhk and uneasiness of Malcolm’s ascension to Demon’s Head – which is hinted here with a standoff between him and Nyssa. Though as these are all hints that can go multiple ways, there is one that we know is going to have uneasy repercussions – The Lazarus Pit. We know Thea’s revival was animalistic, but does any of that remain? It seems like there will be moments of “Savage Speedy” and what this entails remains to be seen. Will she be able to get control of it or will she too become “something else”. Though she isn’t the only one who’s going to get revived. This appears to take place after the Nyssa & Malcom duel, so who was fighting to revive Sarah despite the Pit’s changing nature and who was fighting to prevent it. As we see at the end of the trailer – and knew for a while – Sarah Lance will be revived via the Lazarus Pit. Is this a peace offering from Malcolm? Or does someone else revive her? Will she suffer the same after-effects of the Pit that Thea does? Well I can actually answer that last question – Yes! Sarah will return changed from the Pit, but that won’t be explored as much in Arrow as it will in Legends of Tomorrow. Arrow’s role in the Sarah story is to at least bring her back to the table as a character so when Legends of Tomorrow begins, the groundwork has already been set. Though we should see some foreshadowing with Thea’s path. Yes Sarah is more trained and disciplined, but is that a good thing? Further more she’s been dead longer. Worse of all Sarah’s survived death numerous times, so it’ll be interesting to see how that affects her mentality. But again, that’ll all be explored in Legends of Tomorrow. Finally – or rather firstly considering its trailer placement – we have Ray Palmer. We of course know that he just shrunk and didn’t die; but Starling City doesn’t know that. That’s why it’s renamed Star City. It’ll be interesting to see what other effects this has on Arrow – remember we saw him signing over control of the company quite possibly to Felicity. 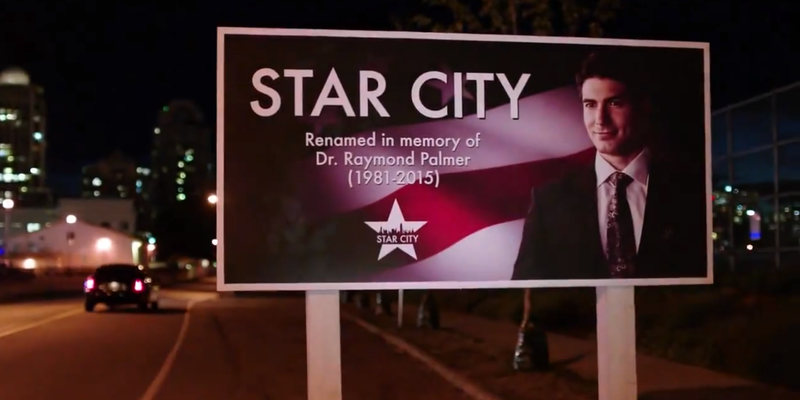 Palmer’s supposed death is of central importance to Season 4 of Arrow and Legends Of Tomorrow, because without it the city would never be renamed to its comic counterpart and he himself could never fade out of public spotlight and become the hero LEGEND he’s meant to be. 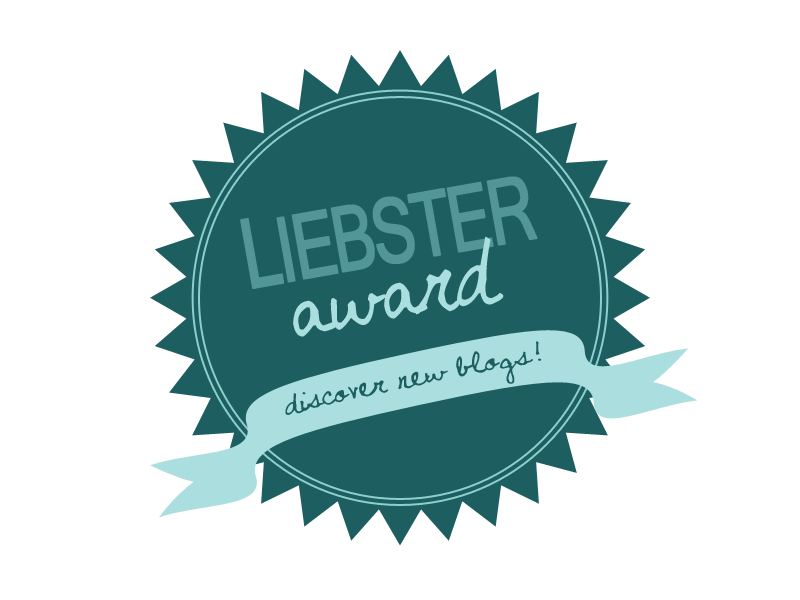 Felicity Smoak’s Badassery – Humor Or Plot Twist? Many people – including myself – were upset by how Season 3 Felicity was entirely defined by her relationships and not her own merit. Even the Felicity Flashback centered episode focused on her relationship with an ex. Yes, there were some spectacular quips and quotes, but no real moments of celebrating her in her own merit. But after seeing this trailer if looks like badass Felicity is back, but not as you’d expect. Felicity vs Metahuman, what could possibly go … oh I take it back! She’s got this! We’ve seen daring and brilliant hacker Felicity, but last Season we got a sneak peak at badass Felicity as she took out a League Assassin by shattering his trachea by throwing her broken tablet. Even Felicity noted how it didn’t make sense. Well, this trailer offered up some similar moments as we see Felicity taking on Double Down, a powerful metahuman who can use playing card tattoo as weapons … so kind of Gambit from X-Men but not. So are these all more funny asides or actually suggestive of something bigger? Well a minor thread that has been steadily growing is WHO is Felicity’s father? And one particular fan theory that has been growing is that the identity of her dad is actually Damien Darhk. Did Felicity have subliminal ninja training as a child? If she is his daughter that could provide a new reason to have Oliver get back into the fight. Maybe he tries to ‘take her back’. We’ll find out soon I guess, but it is still fun to think about. All we know is that there is a lot of secrets to be learned with Darhk – like that strange bumpy item he keeps looking at in the trailer – and that this Ras wannabe seems to mirroring Ra’s role in Batman Begins by ‘letting the city die’. Either way, time will soon tell! So who’s the new tech guy with Felicity? Well, I’ll tell you what: He’s terrific! Seriously though! 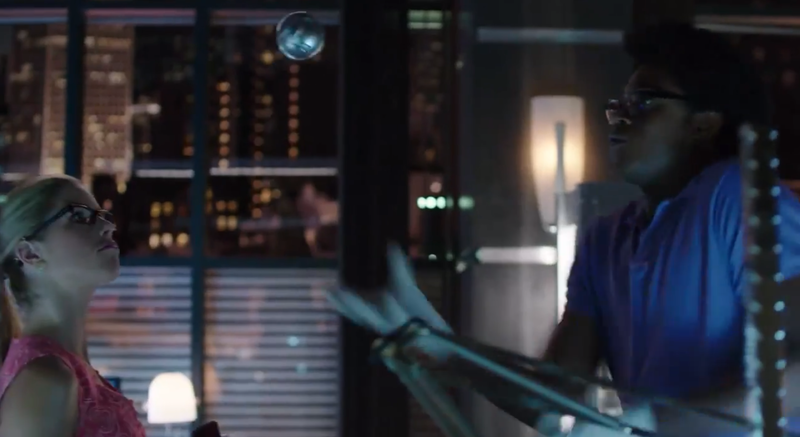 That is Curtis Holt (played by Echo Kellum) who will eventually become the hero known as Mr Terrific! Mr Terrific has no powers of his own, but he is famous for being the 3rd smartest man alive. Beyond being a genius and martial arts master, he has drones known as T-spheres – which we can see in one shot of the trailer – that serve numerous purposes such as flight, projectile attacks, laser grids, hacking and shock fields to name a few. So again, he’s kind of terrific! Now how about that charming blond-haired man? Well as NBC fans would tell you – if they weren’t too busy screaming for joy – THAT is John Constantine (played by Matt Ryan)! 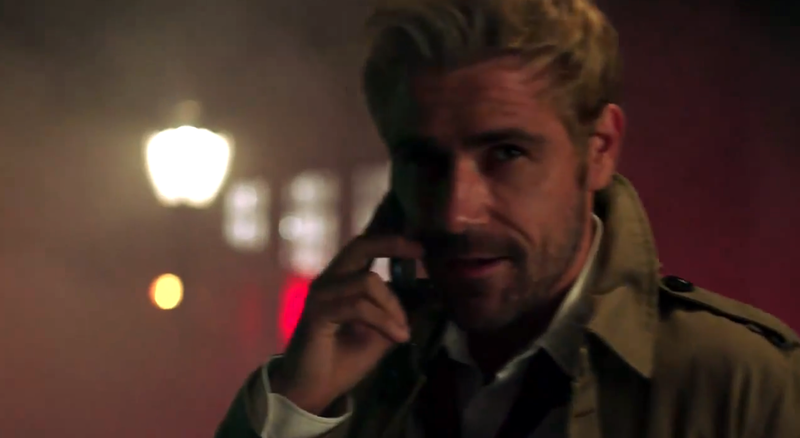 Constantine used to air on NBC and detailed the adventures of demon-fighting detective Constantine battle the supernatural. Seriously watch it! The show got canceled despite being a fan favorite, so the Arrowverse write him in and we couldn’t be happier. He will make his appearance around Episode 4 and will have a role in the Revival of Sarah Lance. After all, supernatural is sort of his thing. 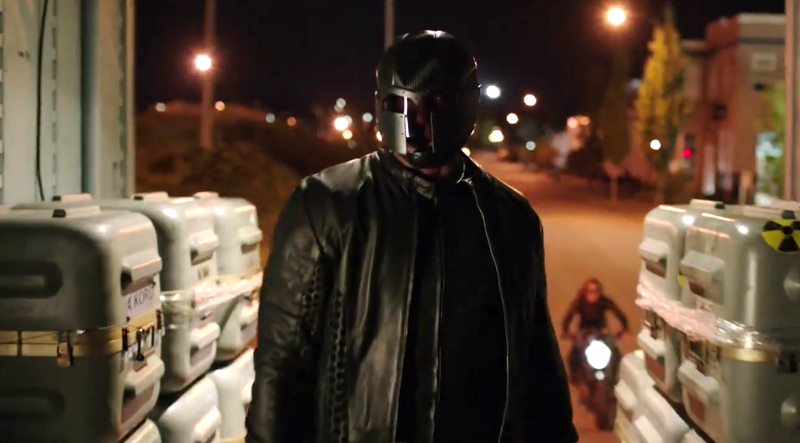 Finally, we have Diggle and his new “identity concealment”. We’re not sure yet which hero he is – Guardian most likely – but that new helmet looks… uncomfortable. To be fair, it looks better in the trailer than in the promotional images; but it still has a very strong Magneto (Marvel villain) feel to it. Honestly, I’m just happy that the helmet does indeed have a visor – rather than the open squished face look. All in all, I’m excited for Arrow Season 4. New faces, new costume, new Spin-Offs being set up. Sounds like a good time to me! Now we just have to wait for October 7th … and a Flash Season 2 trailer… because we’d be totally okay with you releasing one of those CW!